Chris and Alice became owners of Canlis Restaurant, following Peter Canlis’ death in 1977. With “100,000 Welcomes” moving strangers to guests, they have preserved the traditions of this famous landmark ever since, while adding their creativity, energy and warmth to the Canlis experience. Education and travel were major building blocks in Chris’ childhood. At the age of 15, Chris traveled around the world solo. He eventually became a flight instructor in the U.S. Navy and earned his M.B.A from Stanford University. From this background, Chris brings to the restaurant a sense of tradition, culture and excellence. For Alice, who grew up in the South, the warmth of an other-centered family known for genuine hospitality shaped her earliest memories. The family table was the center of her home life, and it became the symbol of a welcoming generosity that is now the hallmark of Canlis restaurant. Alice led Canlis Inc. as President for 13 years and orchestrated the updates which established Canlis as one of America’s best restaurants and the most award-winning restaurant in the Northwest. In addition to its legacy of fine dining, Canlis also has a longstanding legacy in community involvement. Canlis has helped generate several million dollars for local and national organizations. These days, Alice and Chris are happily loving seven grandchildren while influencing their sons, Brian and Mark Canlis at their restaurant. These two have taken Canlis to greater heights of culinary acclaim, including recognition as the only Chateau & Relais restaurant in the Great Northwest. The whole family believes that an evening at Canlis should be a celebration of all that is warm, genuine and intimate. They run Canlis with the daily conviction that there is always something more to discover, enjoy, learn and celebrate in God’s continuing creation of ourselves, our guests and our surroundings. CEO at Business Impact Networks / Business Owner, ServiceMaster/Merry Maids of Olympia, Tacoma and Yakima. Jonathan and Jennifer are business owners with a passion for connecting leaders to create measurable impact which brings sustainable transformation to communities and regions. 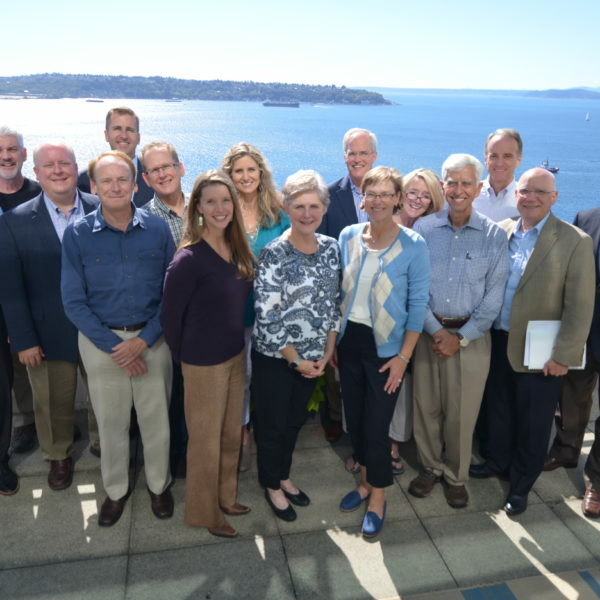 They are agents of reconciliation, weaving together the Body of Christ through generosity and collaboration that brings peace and prosperity to the Northwest and beyond. In addition to serving on the NCF Generosity Council, Jonathan and Jennifer also work in the Middle East, the Amazon and other regions encouraging and catalyzing economic and community development. They live in Olympia, Washington and connect with the broader Body of Christ through Reality Church. John Christianson, Founder and CEO of Highland Private Wealth Management, has provided financial counsel to high net worth individuals and families for over 20 years. John enjoys providing whole-life wealth management advice focused on living fully, writing The Wealth Clarity Blog™, and staying active in various community organizations and events. John is a graduate of the College of Business and Economics at Washington State University and is a Chartered Financial Analyst and a CPA-Inactive status. John and his wife, Kelle, live in Woodinville, and have three adult-age children, and have been long-term members of Woodinville Alliance Church. Dave Cole retired from his role as CEO at Coinstar Inc in March of 2009 and now devotes his time and energy to helping others receive the love that Jesus commanded us to show the world. Dave has great passion for influencing young leaders to be all God designed them to be. He currently caddies (as he explains it) or mentors (as the world explains it) for many leaders in both for- and not-for-profit endeavors. He serves a Board Chair and strong advocate for Jubilee Reach, a Christian non-profit organization that provides a hand up to the incredibly diverse community of Bellevue where more than 80 languages are spoken in the schools. Jubilee Reach is an integrated and full partner with the Bellevue School District; their programs help children build community, confidence, and hope through sports and other activities. Dave and his beloved wife, Nancy, live in Bellevue and attend and serve at Belpres. George Duff is an Executive Coach to several ministry organizations, a Senior Advisor to the Christian Leadership Alliance, and one of the founding advisors to National Christian Foundation Seattle. George is President Emeritus of the Seattle Metropolitan Chamber of Commerce, having served as President from 1968 to 1995. George graduated from Wayne State University and the U.S. Chamber of Commerce Academy of Organization Management; he also received an honorary Phd from SPU. He is a past Chairman of the American Chamber of Commerce Executives and is a member of the Board of Governors of Virginia Mason Medical Center. George also serves on the boards of numerous civic and community organizations. He is past President of the Seattle Rotary Club and is the recipient of the World Citizens Award, given by the World Affairs Council and the Regional Citizen Award of The Municipal League. George and his wife, Marilyn, live on Mercer Island. They have three married children, nine grandchildren and one great grandchild. Steve is a financial advisor managing investments for individuals, families, and business owners. He and his wife Susanna have a desire to see the hearts of those with financial means moved by the needs of others, to respond to God’s clear call to generosity and justice and to cultivate habits of generosity now as their net worth (and expenses) are growing. Steve and Susanna live in Seattle, WA and have three children – Camille, Anna and Daniel. They both aspire to join the professional tennis circuit but are currently content to squeeze in recreational tennis as often as possible. Lance Losey is Managing Director of Wealth Strategy for Ascent Private Capital Management of U.S. Bank. Lance advises client families of substantial net worth regarding the purpose and impact of their wealth. Prior to joining Ascent, Lance chaired the Estate and Trust practice of a prominent Seattle law firm. Lance and his wife, Theressa, are active at Crossroads Bible Church in Bellevue and enjoy raising four children. One of Lance’s sons lives with Type-1 Diabetes, and Lance also serves on the board of the Northwest Chapter of the Juvenile Diabetes Research Foundation (JDRF). Ed McCahill is a Financial Advisor at Ronald Blue and Co.,a national wealth management helping individuals, families and small business clients to discern, clarify and achieve their financial goals. He has an extensive Fortune 500 corporate background and has also owned a successful small business. Ed has a Bachelor of Science degree in Finance from the Carroll School of Management at Boston College and a Master of Business Administration degree from the Manning School of Business at the University of Massachusetts Lowell. Ed enjoys working on non-profit capital campaigns, encouraging generosity, and speaking on topics related to family goal setting, biblical financial management, and inter-generational family finances. He is a former Scoutmaster and Cubmaster with the Boy Scouts of America,an Advisory Board member at Habitat for Humanity Seattle – King County, a member of the Capital Campaign Leadership Team at The Bear Creek School, and an active member of Overlake Christian Church. Ed and his wife, Cindy, are the proud parents of four children and live in Woodinville, WA. As Principal of 10|10 Strategies, Heather enjoys working with people, families, and organizations to strategically align their giving and activities to achieve the impact and outcomes they envision. For the past seventeen years, Heather has helped people and organizations flourish financially. Her roles have included philanthropic advisor to many families, executive director of a private family foundation, program officer at the Bill & Melinda Gates Foundation, and fiscal analyst for the Washington state legislature. A native of Washington state, Heather holds a masters degree in Public Policy from Duke University and a BA in Political Science and Economics from Central Washington University, where she was a Presidential Scholar. Heather is committed to strategic philanthropy and helping people “move the needle” on issues they care about while experiencing the joy of giving. In addition, she loves the challenge of translating complex financial situations into individually tailored plans that are realistic and easy to follow. Heather demonstrates her passion for good stewardship and generosity by providing volunteer financial coaching for families in need and teaching seminars on generosity and handling finances in a healthy manner. She serves on the finance committee at her church and on the boards of African Leadership and Reconciliation Ministries and the National Christian Foundation Seattle. Heather enjoys golf, hiking, camping, travel (especially to Africa), country music, and dinner parties under the stars with good wine and good friends.